After the funding plan legislation passed, Durkan set up a cross-department Bridge Housing Investment Strategy sub-cabinet in her administration, led by Deputy Mayor David Moseley, to investigate a wide range of options for bridge housing. According to Durkan, the sub-cabinet looked for creative examples from other cities on how to house people at scale under emergency conditions. They also spoke with refugee organizations to learn how they would house 5000 people in a refugee crisis — they learned that those organizations look at the assets on the ground — components of the “built environment” — that you can utilize very quickly without waiting. Longer-term, city staff will be applying those lessons, looking to utilize not just vacant land under city control, but also “underutilized” built properties that could be adapted quickly. They also want to explore other options, such as master leasing of existing apartments, portable modular bunkhouses or cabins, and other larger temporary structures. In the short-term, the city is focused on a plan to use the available funds to make more enhanced shelter space available, preserve existing basic shelter, and expand the number of tiny home villages. They actually have more money to work with than they expected to have: the property sold at a higher price, and nearly $1 million of additional Real Estate Excise Tax (REET) funding was found, so the city altogether has nearly $7.25 million to spend now. Over the last year, the city has expanded and improved its pipeline through shelters into permanent housing. 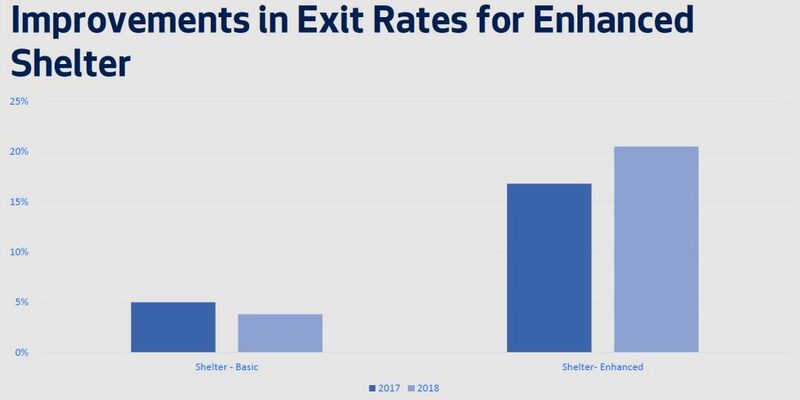 It is serving more people, and has increased the exit rate from enhanced shelters (basic shelter continues to show poor results in terms of exits to permanent housing). The numbers in the first quarter of this year look even better, according to HSD. With the continued recognition that enhanced shelters are both preferred by people experiencing homelessness and also more effective at stabilizing people, the city has focused on continuing to expand its enhanced shelter capacity. But also recognizing that it needs a diverse set of options to be most effective, the bridge housing proposal increases capacity across the board — a 25% increase in capacity in just 90 days, enough to serve an additional 522 people each night. extension of support for 163 basic shelter beds run by DESC that were scheduled to go offline in May. The city argues that the new shelter capacity is desperately needed; it claims its existing 2,032 shelter beds are at 93% capacity. Other than the Mary’s Place beds, all the new capacity created by Durkan’s proposal would be available for the Navigation Team to refer people into, helping to immediately move people from the highest-priority unsanctioned encampments into safer places. The city is discussing with Olympia whether some recent additional state funding can be used to expand the Navigation Team to get more people off the street even faster. It’s important to note that this is one-time funding, which will last through the end of 2018. Sustained support through 2019 would cost another $8.75 million; Durkan said that she plans to address that with the City Council in the regular budget development process next fall. Durkan emphasized that she continues to push on measuring performance and driving transparency and accountability both within city government and in service providers. When pressed as to whether she will continue to enforce the “performance pay” provisions in human service provider contracts, she said that she will, but she will also focus on making sure that the city is providing the right resources to service providers to allow them to be successful — including sharing best practices from the service providers who are succeeding in meeting performance goals. The performance pay provisions are controversial; opponents argue that they punish providers who focus on the people who are the most challenging to serve. HSD’s Johnson claims that the performance statistics they have collected so far don’t support that argument. The Mayor also said that she continues to push hard on the “One Table” regional approach, arguing that the region needs to take the same approach to homelessness that it does for transportation and public health. She emphasized aspects of the MOU she signed with King County earlier this month that strengthens joint governance of programs and establishes a single, joint RFP process. But she also noted that the regional approach requires other local governments to step up and do their share too (*cough* *cough* Bellevue *cough*) and she intends to use her position to increase pressure on them. Of course, it’s become clear that the critical lack of affordable housing is the biggest impediment to moving people from homelessness to permanent housing, and the Office of Housing is touting the 4,400 units expected to come online between now and 2021. In all, Mayor Durkan and her staff seem to grasp that they need to increase capacity at every step in the pipeline, while also not forgetting that the most effective approach, when possible, is to prevent people from becoming homeless in the first place. But in the short term, her focus — which she emphasized several times in the press briefing — is to quickly get as many people off the street as possible to places where services can be delivered to them. Legislation implementing this plan will be transmitted to the City Council in the coming days, where it will go through committee deliberations and might see some further tweaking. But since it doesn’t take funding away from any existing service providers, nor does it touch any of the hot-button issues (such as expanding the Navigation Team or increasing “sweeps” of unsanctioned encampments) it’s unlikely to see much opposition — more likely just debate about the right proportionality of spending across different programs. The City Council has yet to resolve its internal disagreements on how to spend the head tax revenues; there’s a fair chance that will spill over into this proposal as well. 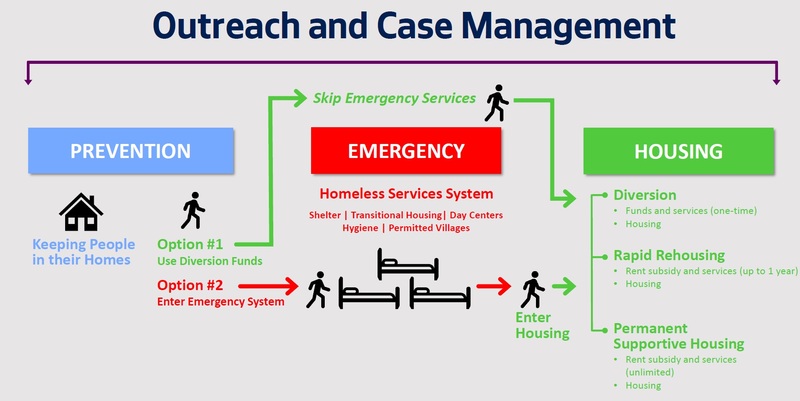 As an aside: we’re seeing a refreshing change in the Human Services Department under Mayor Durkan and Interim Director Jason Johnson, who are being far more open in sharing statistics on the city’s homeless response, such as the charts below (and others in their pre-briefing to reporters).